To create the soundscape for the exhibit, at the San Francisco Conservatory of Flowers, he began by searching for a melodeon, a reed organ often played in the saloons of the Barbary Coast, the city’s infamous red-light district. He soon located one from the 1850s in a workshop in one of the city’s roughest neighborhoods. Andrew Roth recording on Mount Sutro in San Francisco. The microphone ‘always gets me stopped at the airports,’ he jokes. “OK, we’re on,” he tells Kymry Esainko, a musician friend he has asked to play the melodeon on a recent morning, after Mr. Roth, 39, had attached two microphones to the organ. Mr. Esainko, who had never played a melodeon before, began thumping out a version of “Oh! Susanna,” the Stephen Foster song first published in 1848. “I’ll take a couple of those bum notes out” in the final edit, Mr. Roth teased, explaining that he liked the “rough feeling” of the old instrument. 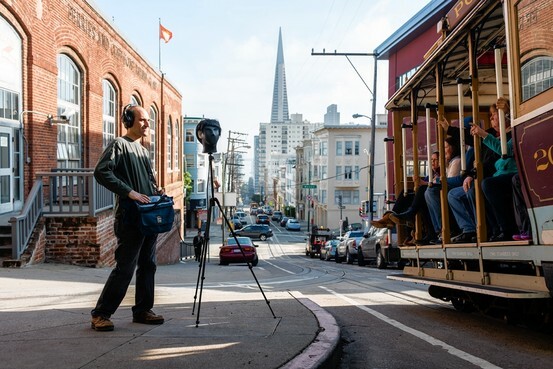 Mr. Roth tests a binaural recording device to capture cable car sounds, right. The device is embedded in a mannequin head with microphones in each ear. The goal: to create the sensation of 3-D sound when played back through headphones. A sound designer who has worked on exhibits at Disneyland and on History Channel programs, Mr. Roth is part of the San Francisco Bay area’s small but influential digital music and audio scene. His projects often focus on history and the natural world, capturing sounds from different centuries and places and weaving them together into tapestries. For a 2003 CD, Mr. Roth recorded the whistles of ducks in Japan, left. He is pointing a microphone at the ocean, where a flock of ducks had landed about a quarter-mile away. He later used a software program to strip away all but the ducks’ cries. His fascination with sounds, especially from the past, began at an early age. Growing up in San Francisco, Mr. Roth devoured books and movies about time travel. He liked listening to old radio shows like “The Shadow” and “The Green Hornet” and 99-cent tapes of Abbott and Costello while sitting in the dark for what he calls “pure sound experiences.” Inside a tent covered by blankets in his bedroom, he also created soundscapes for his family and friends. He believes that he has been unusually sensitive to sounds since he was a kid. When his parents took him to his first rock concert—the Moody Blues, at an outdoor stadium—he pulled a blanket over his head because it was too loud. The audio effects in “Star Wars” made a deep impression on him. He later helped create the Smithsonian Traveling Exhibition’s audio tour on “Star Wars,” which included interviews with its creator, George Lucas, and its influential sound designer, Ben Burtt. “Lucas famously said that sound and music are 50% of the entertainment of a movie,” recalls Mr. Roth, who wrote his essay for college applications on his experience helping to create a “car-horn symphony” one weekend at the city’s Exploratorium museum when he was in high school. Mr. Roth studied European history at Oberlin College but soon returned to the Bay Area to work at Earwax Productions, a collective of sound designers that now work out of Francis Ford Coppola’s Zoetrope Studios. There he began working on sound design for the History Channel and A&E Television. Later, during the dot-com bust, he struck out on his own, working from the spotlessly neat home studio that he built for himself in San Francisco’s Potrero Hill neighborhood. His projects have taken him to some unusual places. For his first installation for the Conservatory of Flowers in 2009, he strung 200 feet of microphone cable off the Golden Gate Bridge to capture the sound of the foghorns. 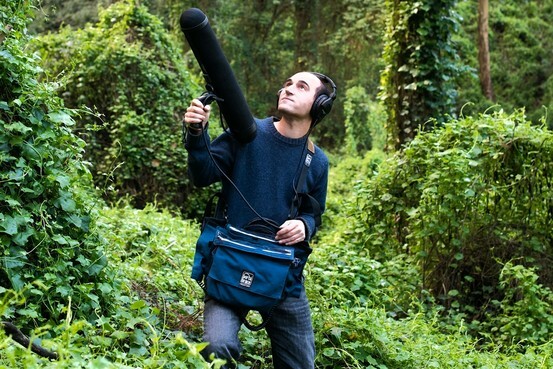 For a CD he produced on the natural sounds of Costa Rica, he zip-lined to a platform 80 feet above the ground, in the canopy of a rain forest, to capture the sounds of howler monkeys at dawn. 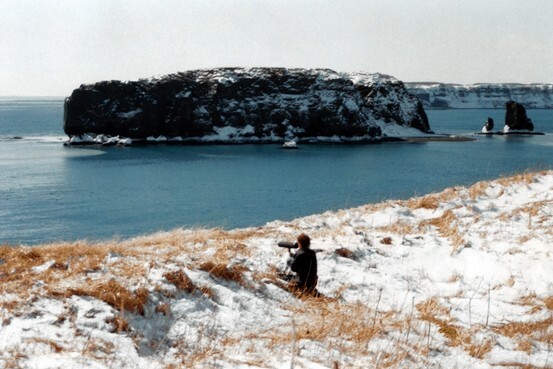 For another CD, on the natural sounds of Japan, he wielded a pickax to break a hole in thick ice. Using a long bamboo fishing pole, he wedged microphones underneath to collect the sound of ice cracking in the remote Shiretoko National Park, a Unesco World Heritage Site. “I come back with cuts and bruises, but when it’s all done, I’ve created a sound tapestry,” he says. For the “Boomtown” exhibit, in addition to the melodeon, he found and recorded dirty jokes and slang from the 19th century, an 1840s banjo with real catgut strings, a Cantonese traveling opera, and the creaks and seagull cries from the city’s historic Hyde Street pier. “I don’t really understand what he does, but he just shows up and works magic,” says Lau Hodges, director of operations and exhibits for the Conservatory of Flowers. The big hit of his latest project is a simulated TNT explosion, which includes recordings of staffers using Gold Rush slang and a subwoofer that makes a barrel shake. Mr. Roth likes to include inside jokes in his installations. The uproarious laughter among the ladies in the brothel is actually a recording of several of the conservatory’s female staffers swapping the dirty jokes Mr. Roth dug up from the period. He says that his creativity comes, in part, from drawing on some of the powerful sound experiences of his childhood. When he was young and listening to recordings in his bedroom tent, he believed that sounds could transport him to another time and place. He still believes that today.